Archbishop Wilton D. Gregroy responds to current events within our Archdiocese, and around the world. Regarding the October visit of Father James Martin, SJ, to the Archdiocese of Atlanta: “The Reverend James Martin, SJ, is a priest in good standing of the Society of Jesus and a Consultor, appointed by Pope Francis, of the Vatican’s Secretariat for Communication. He was recently a presenter at the World Meeting of Families in Dublin, Ireland. Several weeks ago, I was asked by one of our pastors to invite Father Martin to share his perspective on ministry to the LGBTQ community as part of a larger, local parish conversation. I did not hesitate to support that pastor in extending the invitation. A second parish then asked to host Father Martin during the same visit. August 9, 2018, Archbishop Gregory released a statement related to the resignation of Theodore McCarrick from the College of Cardinals and related revelations: https://vimeo.com/284047544. 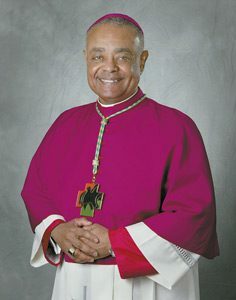 A transcript will be released shortly, as will a link to then-Bishop Gregory’s 2002 Presidential Address to the United States Conference of Catholic Bishops to which he refers in the statement. IMMIGRATION: In response to the current news headlines about immigration, the Archdiocese of Atlanta has made these support materials about Immigrant Rights and current Immigration Law available to us. Please see the “Know Your Rights Card” and information about how to obtain an immigration free evaluation.